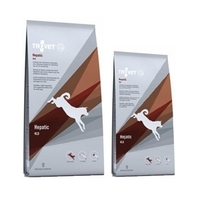 Trovet Intestinal single protein and single carbohydrate diets are designed for dogs with food hypersensitivity. Dogs with food hypersensitivity often suffer from pruritus, bad skin, diarrhoea and/or vomiting, because of an impaired reaction on a food substance. Giving the dog a food that does not contain any of the ingredients to which the dog is hypersensitive can relieve these symptoms.